Magic Online was (and still is, until the downtime on Wednesday!) offering Shadowmoor–Shadowmoor–Eventide drafts. I love drafting a variety of formats. Shadowmoor block is among the few Limited formats I’d never played, so naturally I drafted it a lot. I was doing pretty well; I won two of my first three drafts. Draft four had a fatal misplay on my part. It was round one, game three. The board was cluttered. Both players’ clocks were very low on time. My opponent had been getting prodigious value from Order of Whiteclay (which I turned green during this fateful turn). I had two life and was being attacked by a one-power flying creature which I could not block or kill. 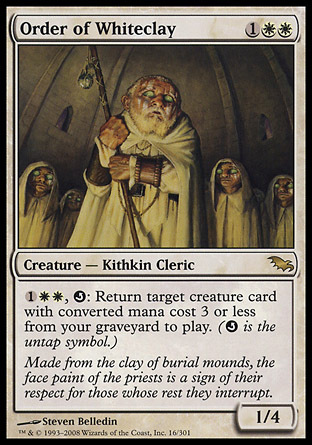 The next time my opponent attacked, I would die from the faerie. My opponent had ten life and a Barrenton Medic with one -1/-1 counter on it (effectively being at 14 life, to say nothing of blocking), so killing my opponent in one turn via damage was impossible. 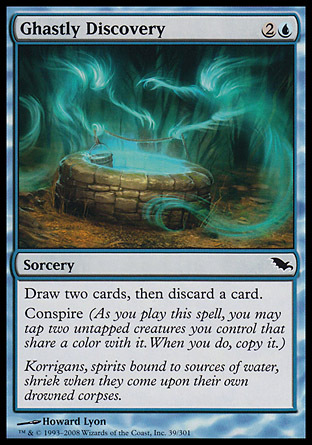 I had one out: Drowner Initiate, a card I’d decided to try, and who was proving to be an all-star. My opponent had four cards left in his or her library thanks to my dinky 1/1 for one. 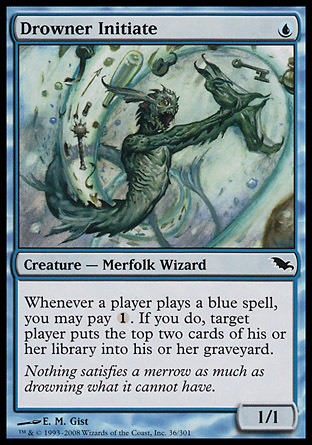 If I could cast two blue spells, I would mill my opponent to death. I had no blue cards in my hand but I could draw Ghastly Discovery, conspire it, and hopefully find any spell (my deck was mono-blue) to secure my victory. The odds weren’t terrible—I had thirteen cards in my library (and knew the bottom four cards due to Advice from the Fae, one of the four being a Ghastly Discovery). 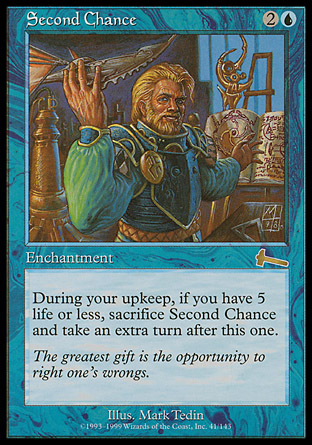 I had a one-in-nine chance of drawing my remaining Ghastly Discovery and was likely to find a non-land card with four draws. This was the only way I could win the game. My opponent attacked with an 0/3 Order of Whiteclay (it had a -1/-1 counter on it) and everything else not named Barrenton Medic. I remembered that my opponent could use the Order to resurrect a dead Medicine Runner and remove a -1/-1 counter at instant speed. I was going to take one damage from Silkbind Faerie, so if I didn’t block the 0/3 Order, I would die. So, I blocked it. 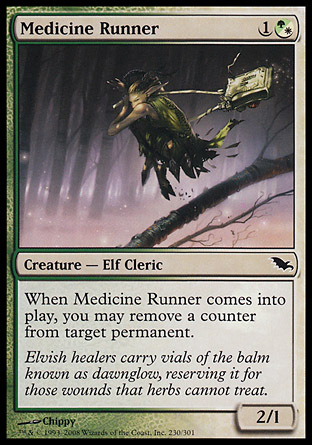 Then I forgot about the dead Medicine Runner (it wasn’t relevant to my blocks as they were). I saw myself blocking an 0/3 Order of Whiteclay and thought, “Why not kill it? It’s the reason that I’ve been losing this game. It’s just an 0/3.” I neglected to consider that Order of Whiteclay was irrelevant by then; Silkbind Faerie was going to kill me the following turn. Still, it’s not a sin to block and eat a creature “for free.” So I blocked the Order with enough power to kill it (forgetting about the dead Medicine Runner and the Barrenton Medic), and my opponent used the Order to recur Medicine Runner, healing it back to 1/4. The Order lived, and one of my blockers died. The blocker was Drowner Initiate. 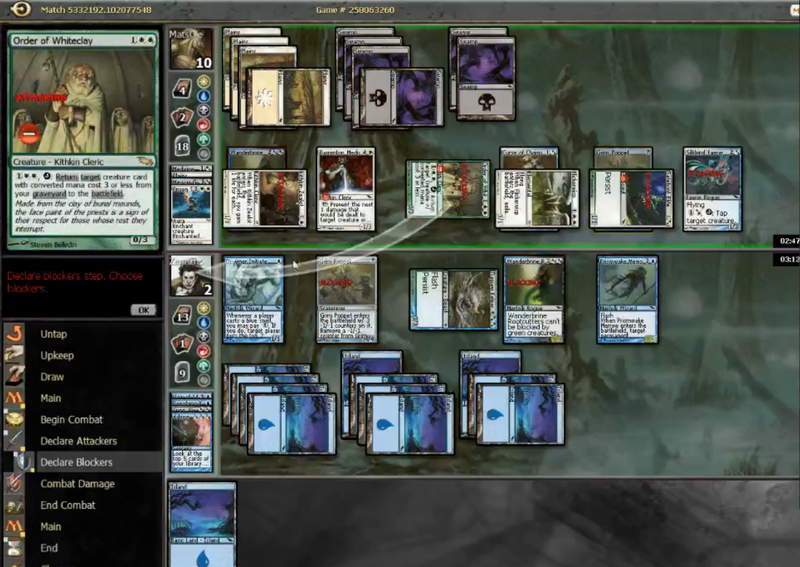 I drew Ghastly Demise for the turn, conspired it, found a second blue card, and conceded. There’s a video of it at all here. Yeah, I screwed up. I punted the match. I lost sight of what was really important—winning the game—and locked myself into a poor line of play. What’s important is what came after. I took a moment to calm down. I figured out when and how I was in error. I made a note to not make that kind of mistake again. I returned to the Shadowmoor queues and haven’t lost a draft since. Mistakes are more important than successes. When you play well, you can pat yourself on the back and enjoy the spoils of victory. When you make a mistake, you are presented with an opportunity to improve. You can get angry, complain about the shuffler, throw your deck in the trash, or “quit” the game—but then you’re only going to play worse the next time that you make a mistake (Jackie Lee has written an excellent article on just how bad tilting can be for your play and your health). If you want to improve, then find a way to calm down, reflect on what went wrong, and determine how you can help avoid making that mistake again. I have a tendency to lose the forest for the trees, so I frequently remind myself to focus on my goal. “Am I on the defensive? If so, what do I need to do to turn the tide?” “Am I ahead? If so, how do I press my advantage and how do I maintain it?” “What is my win condition? Do I have a backup?” These are the questions I need to ask—otherwise I tend to get lost in some irrelevant sub-game that I’ve created (like killing an Order of Whiteclay). That’s all for this week. I’d be happy to hear any of your stories or your techniques for dealing with mistakes—leave a comment! When we’re playing to the best of our abilities, win or lose, we’re always Drawing Live. twitch.tv/ZennithGP—livestreaming Shadowmoor all week long! Screen shots are my favorite!!! oh baby talk dirty to me like that yeah. also – give yourself a cool gravatar image of you, please. you’re part of the team now, no need to be a collection of shapes. This… is… my real face.